Our product range includes a wide range of curtain eyelet punching machine. Curtain Eyelet Punching Machine is capable of setting eyelets with an internal hole size of up to 40mm diameter. 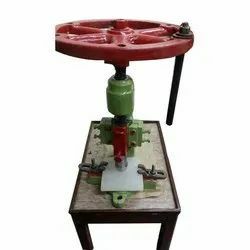 This Machine comes with two sets of Die, one for cutting of holes and another one for the setting of eyelets. Die can also be made as per customer size and requirements. This machine exerts a pressure of 2.5 Tons which makes it ideal for curtains and working through multiple layers of material with ease. Setting dies can be quickly changed to fit different sized eyelets.